While US President Donald Trump has said he may pardon boxing legend Muhammad Ali posthumously for a draft-dodging conviction, the late boxer’s attorney responds that the pardon would be “unnecessary,” as back in 1971 The US Supreme Court had already overturned the conviction. “We appreciate President Trump’s sentiment, but a pardon is unnecessary,” Ali’s lawyer Ron Tweel said in a statement Friday. “The US Supreme Court overturned the conviction of Muhammad Ali in a unanimous decision in 1971,” he explained. Tweel told CNN that there was no contact whatsoever between anyone in the Trump administration and members of the Ali family about the issue. Ali was arrested in 1967 when he refused to be drafted into the US military during the Vietnam War and was sentenced to a $10,000 fine and five years in prison. 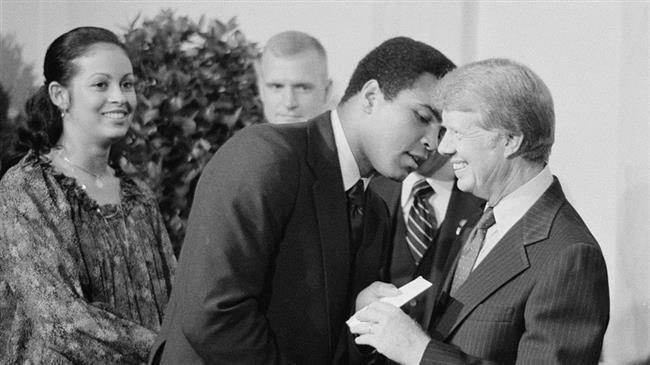 However during the 1971 US Supreme Court case Clay v. US, Ali was cleared of all charges. The court unanimously decided he was in fact a true contentious objector and not just a draft dodger. “In this Court the Government has now fully conceded that the petitioner’s beliefs are based upon ‘religious training and belief,” the court’s opinion said. “I’m thinking about Muhammad Ali. I’m thinking about that very seriously and some others,” Trump said, while speaking to reporters at the White Friday. Last week, Trump told reporters he was considering pardoning Martha Stewart and commuting the sentence of former Illinois Governor Rod Blagojevich. Since being in office, Trump has granted five pardons and commuted one sentence. Last month, Trump posthumously granted clemency to another boxer Jack Johnson, the first African-American world heavyweight champion who was convicted in 1913 under the Mann Act for taking his white girlfriend across state lines for “immoral” purposes.